A Mutant Digimon that once wandered into the research data for ancient ruins on a neglected computer, and over a long period time unified with that data. 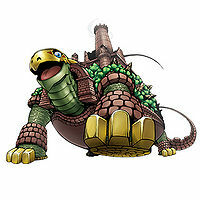 Once its head, arms, and legs are retracted, it looks indistinguishable from the ruins of an ancient fortress. 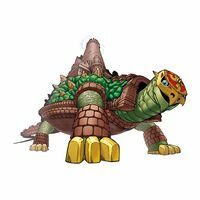 The enormous quantity of research data it holds has turned it into a slow-witted Digimon with a large build; nevertheless, bringing it down is likely a difficult task, even if it is attacked by scores of Digimon. It is the very definition of an impregnable Digimon. 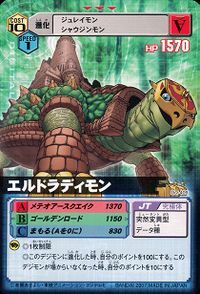 Its Special Moves are charging the opponent with its large body and breaking through, even while under attack (Golden Road), and striking with its gigantic foot, shaking the earth (Meteor Earthquake). Also, it can bite through the opponent with the power of its mighty jaws (Giant Nipper). | El Dorado was the name of the legendary South American city of gold. 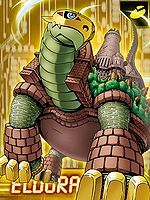 Anime/Manga Digimon Savers: "Imprisoned Masaru, The Holy Capital's Trap"
Golden Road  ゴールデンロード Gōruden Rōdo Charges the opponent with its large body and breaks through, even if it suffers an attack. Meteor Earthquake  メテオアースクエイク Meteo Āsukueiku Strikes with its gigantic foot, shaking the earth. 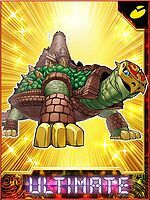 Giant Nipper  ジャイアントニッパー Jaianto Nippā Completely gnaws through the opponent using the power of its strong jaws. El Doradimon is available as a Digimon Medal. 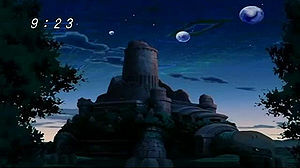 This page was last modified on 16 October 2018, at 11:19.